Le narrateur est vraiment impliqué dans l'histoire et étant donner que le livre est à la 1ere personne, cela rend la 'lecture' parfaite! I CAN'T STAND THE SNIFFING. Does Masters have a cold or is he just a pig? gets a little better with each book. I will try the next in this series . 48 sur 53 personne(s) ont trouvé cet avis utile. I was set on finishing this book because my husband loves the series, I did but it was a struggle. Harry is just such an unlikable person and does so many illogical things it annoyed me to a great extent. So much could have been avoided by him not being such a painful sexist fool. Of course nobody wants to read a book about mister perfect, but Harry has so many demons plaguing him, makes so many silly mistakes that I couldn't connect with him on any level at all. The voice actor is good and fitting, but is very whispery which makes it hard for people with not ideal hearing and I may have missed out on some of the book because of that. The felt the voice of the narrator was pretty for most of the book but there was a definite lack of emotion during the more dangerous or thrilling scenes. Even if outwardly Dresden is calm, inwardly he is definitely not and the danger and thrill seems pretty bland. I thought this was going to be much better than it turned about to be. Will ask for an exchange from A.com. I had heard good things about this series of books, but I was so disappointed! The story was shallow, predictable, and mediocre at best. And even though I have been a fan of James Marsters for many years, his reading of this book was terrible! It was so full of heavy breathing, heavy sighing, and without any kind of animation that he came across as incredibly bored, which made me bored very quickly into the book. I reluctantly finished it in order to be fair, but it was so breathy that it was like listening to an 8 hour obscene phone call! So sorry, but I won't be listening to any more of these books. Where was the quality control in this project? Multiple times you hear the narrator moving around on his leather couch or chair. He never reads the chapters, so there are no breaks at all or indicators of where you are in the story. There was even a point where you could hear ice in a glass and him reacting as he spilled it. Completely unprofessional. I would give it negative stars if I could. The story was great though! Jim Butchers first Dresden file book was definitely one for anyone in love with mysteries but wishes for more magic in them. Definitely worth a read... book but I’d say this audio book should be a pass if you want a quality, well edited work. The smacking of his lips and swallowing during the reading is behind annoying. Story was good but recording is the worst I she ever heard. It was a good book, but the narrators heavy breathing got really old really fast. Listen if you can manage. I loved the story and the narrator voice acting, but, like others, found the excess captured physical noises like breathing, swallowing etc very distracting. The chapter or section transitions were also very abrupt...breaking the flow. I am glad I purchased it and would highly recommend it to all, but I hope they fix the sound issues for future books. 160 sur 200 personne(s) ont trouvé cet avis utile. I wanted to like the main character, Harry Dresden, and the story, especially given that this book was highly rated when I came across it, and the concept of a modern-day wizard detective (as Dresden is) holds good entertainment potential for me. I chose this book because I was hoping to get wrapped up in a new mystery series and this is the first book. Maybe I'd consider another if there is a different narrator; however, at this point, I'm planning to try my luck elsewhere. DER SPRECHER: Wer englische Hörbücher mag, wird mit James Marsters (bekannt durch seine Rolle als Spike in der Fernsehserie "Buffy, im Bann der Vampire") als Erzähler keine Probleme haben. Suverän übernimmt er als Ich-Erzähler die Rolle der Hauptfigur, Harry Dresden. Sein amerikanischer Akzent ist unverkennbar, gleitet aber nie in ein unverständliches Genuschel ab. Marsters gibt dem Hörer über weite Strecken des Hörbuchs wirklich das Gefühl, er "erzähle" und lese nicht ab. Das macht es kurzweilig und spannend ihm die vollen acht Stunden zuzuhören. 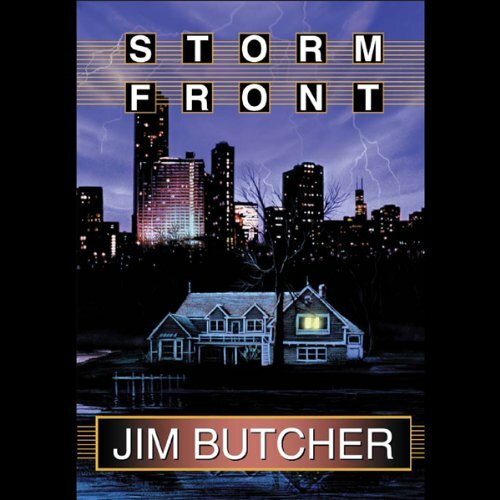 Da kann man nur bedauern, daß es von ihm nur so wenige Hörbücher gibt.DER PLOT:In Storm Front skizziert Jim Butcher die Welt seiner "Dresden Files". Harry Dresden unterscheidet sich von seinem Film Noir Kollegen Philip Marlowe gerade mal dadurch, dass letzterer mit arkanen Dingen nichts am Hut hat. Ansonsten gleichen sie einander wie Brüder, stehen als einsame Streiter für das Recht gegen die nur allzu menschlich korrupte Welt. Mögen Dresdens Gegenspieler auch mit mancher Zauberei hantieren, ihre Motive sind dann doch wieder genauso banal und alltäglich wie die von gewöhnlichen Verbrechern. Und genau hier liegt die Stärke von Butchers Romanen: Der Zuhörer kann sich ohne Probleme in dieser Welt mit Feen und Magiern, Vampiren und Dämonen zurecht finden, weil letztlich doch wieder alles auf Habgier, Neid, Geltungssucht zurückzuführen ist. Motive, die nur allzu vertraut sind. Ich fand das Hörbuch gut, aber nicht extra klasse, mir hat ein bisschen das Salz in der Suppe gefehlt. Die Geschichte ist gut erzählt, war mir manchmal aber etwas zu stereotypisch für eine Detective Story (z.B. Nur gut Aussehende Frauen, eine "Typische" Barszene). Auch die Charaktere hätten ein bisschen Schliff vertragen können. Erinnerte mich sehr an die Bobby Dollar Reihe von Tad Williams, die hat mir allerdings vom Schreibstil etwas besser gefallen. Der Vorleser ist gut bis sehr gut, macht nur manchmal kleinere Kunstpausen die ich eher irritierend fand. Trotz der "Mängel" habe ich Lust die Reihe weiter zu verfolgen und werde mir das nächste Hörbuch auch gleich runterladen. Spannende Unterhaltung, nie langweilig, sympathischer Held, ausgezeichnet gelesen - ich freue mich schon auf die nächsten Bücher dieser Serie! Top gemacht. Angenehme Stimme und die Reihe ist ohnehin sehr gut. Macht weiter so. Gespannt auf die nächste Folge. Unusual Pulp-Potter Wizard PI Story with a lot of post fairytale magic and monsters. The typical broke and single Dirty-Harry kinda Private Investigator / Wizard Harry Dresden stumbles head on into a classical pulp-fantasy murder case, where the lines between investigator and suspect, magician and gunslinger, clothed and naked...sane and insane begin to blur. Marvously indifferent performed by James Masters the story is in a weird way fresh and funny and Even from the esoteric point of view well written. Harry Dresden ist humorvoll, witzig, intelligent und ein bisschen "dark". Der Plot ist stimmig, die Fantasywelt ist nicht niedlich, dafür aber umso spannender. Geniale Serie! Nice story - commences slowly and ends in a bang. This was the first book of Jim Butcher that I've read. Result: Good read - if you enjoy some witchcraft and fantasy. The narration was good. But it is highly irritating when you can hear the narrator swallow spit after every few sentences for 8 hours. This recording should have been professionally edited to remove those sounds.